MENA PALACE Hotel was built in 2004 and publicly opened in May 2005. It is situated in the center of the largest Black Sea resort named SUNNY BEACH, only 150 - 200 m from the beach and 30 km from Burgas Airport. 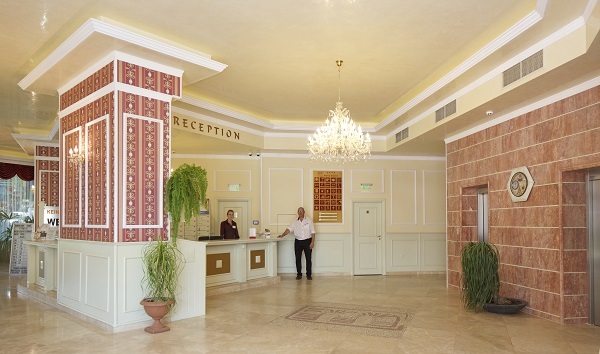 In 2016 the hotel expanded its base with one more wing of triple and quad rooms..
All rooms and apartments are equipped with central air conditioning, satellite TV, mini bar, hairdryer, balcony, phone and private bathrooms equipped with a shower for the rooms and a bath for the apartments. Safety deposit boxes are against charge at the reception. There are also English and German books which are available to the guests. The currency exchange office is directly next to the Reception desk.